This time for my design team project for The Cutting Cafe, we had to pick a shaped card and make it into a notepad. I chose the T-Shirt Shaped Card. I used my favorites, black and gold to make this fabulous note pad. I added flat back pearls randomly on the front and added a fringe trim as well as some black and gold rhinestone trim. I chose to use black paper on the inside which will require the use of a metallic marker. 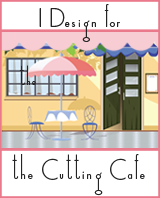 Please stop by The Cutting Cafe Blog on the 7th and 21st of each month to see all of the design team projects. Leave a comment and you just might win three files in the drawing on the next post.